The United States and the Slovakian Men's Hockey teams opened up their Olympic games Thursday in Sochi. 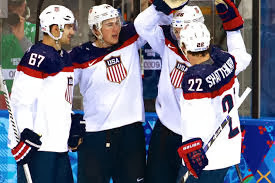 As expected, the United States had no trouble handling the Slovakians, and managed put up a touchdown and an extra point to defeat Slovakia, 7-1. The United States got on the board first, 14 minutes in, when Phil Kessel made a drop pass to John Carlson at the top of the faceoff circle, and Carlson unleashed a rocket to beat Jaroslav Halak. The Slovakians would tie it up just 24 seconds into the second frame, with Tomas Tatar making a nice move to the right of Jonathan Quick, and firing one right past him. The play was actually offside, however the linesmen missed it, and the goal counted. Any hopes for a Slovakian upset were immediately put down, as the U.S. scored two goals in the next two minutes coming from Ryan Kesler and Paul Stastny. 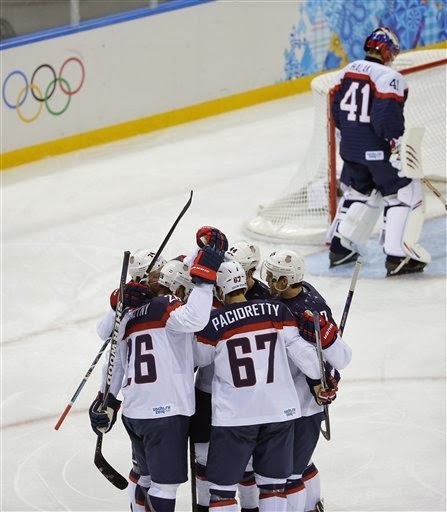 A fourth goal was put up for the US just six minutes later, when David Backes found the puck following a long net-front battle, and put it home to put the U.S. on top by 3. But the Americans weren't finished for the second period, as they put three more goals on the board later that period in less than 2 minutes, coming from Stastny (2), Kessel, and Dustin Brown. Following Stastny's second goal, Slovakia switched goalies, putting in Peter Budaj. A quieter third period saw no scoring, and the United States finished off Slovakia by a final score of 7-1. USA had 11 players tallying at least a point.